What happened to Kaiapoi Museum? 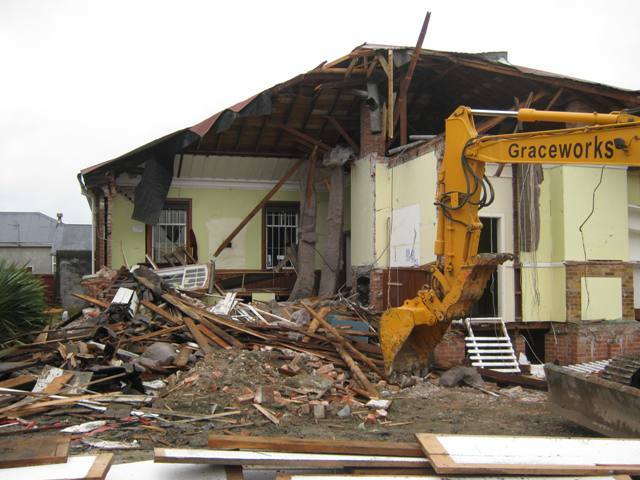 Confusion, police eviction, the threat then reality of demolition – the Kaiapoi Museum people have had a shocking time. 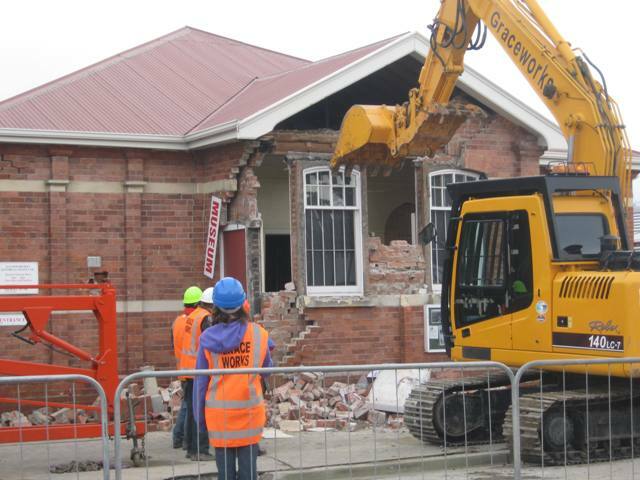 It was clear early in the week after the Canterbury earthquake that the Kaiapoi Museum (housed in the Kaiapoi Historic Court House) was being assessed for demolition. The President or the members of the museum committee were not notified of the decision to demolish and only found out from the tenant of a neighboring building. Intervention by the Committee and New Zealand Historic Places Trust (NZHPT) to save the Category 2 building was unsuccessful. Full credit goes to the committee and volunteers who did a great job of collection and record retrieval over the next week. They worked under extreme pressure and at a very worrying time for everyone. On Thursday 9 September several museum members were given permission by a building inspector to enter the newer part of the building. They started to remove filing cabinets and office records and then moved on to taking down photographs from the walls. However the building inspector had not let the Civil Defence (C.D) know of his decision and these members were evicted by the police. They were given the understanding that they would be able to remove the rest of the material and artifacts later under supervision. On Friday 10 September a small number of museum members under C.D. supervision worked until 9.30pm with torches to get most of the collection out and stacked into two very large containers on the street outside. Further items missed were brought out by the demolition staff the next morning. 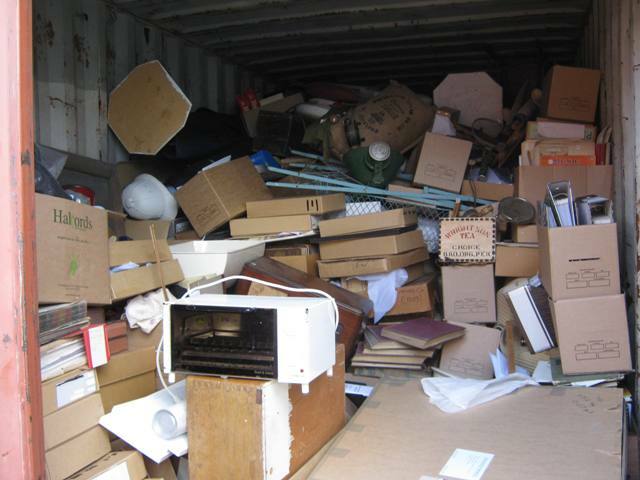 Although there were some losses, most items were later safely repackaged by a team of 15 volunteers and are now stored away in a secure building until new plans evolve about the future of the museum and its collection. Patron of the Kaiapoi District Historical Society and convener of the North Canterbury Museums Group, Ivan Taylor who has over 40 years experience as a heritage building advisor and knew the building very well, is of the opinion that it could have been saved and restored rather than demolished. He understands that the NZHPT conservation engineer was also of the same opinion. The Committee wants to know why the demolition happened in such a hurry. Ivan has written to the Waimakariri District Council on behalf of the Society, seeking answers. The Committee think that the damage to the building, while significant, was probably repairable and given that there was no immediate danger to people from a building collapse, more time should been allowed for decision making about the building and the collection’s future. At one point the building was signed off as being empty for demolition by the engineer with the collection still inside untouched. He also made the following comment, “That it was only an old brick building full of trinkets.” Ivan comments that he probable didn’t even go inside the building, and certainly didn’t have any understanding of the buildings contents or heritage value to both Maori and European local and National history. This court building was originally used as the Maori Land Court for the South Island until 1940, establishing all the early South Island Treaty and Land Claims. The museum contained items and documents recording the 180 plus years of Kaiapoi’s district history. The demolition took three full days and the demolition contractor reported that the building was still very strong as at no stage did any part of it fall down of its own accord, he had to either pull or push every bit of it down. 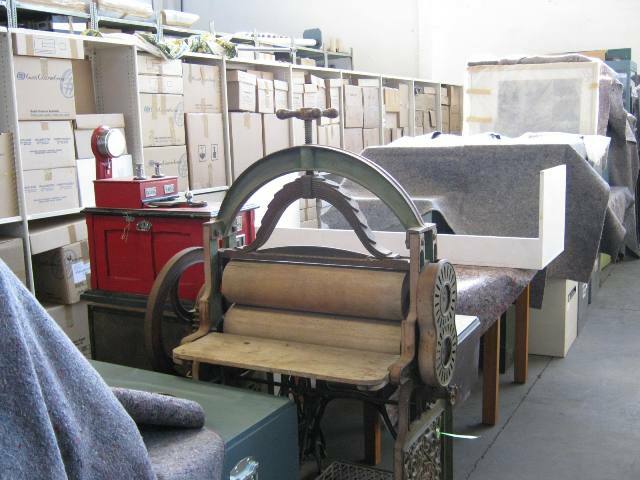 Administered by the Kaiapoi District Historical Society and housed in Kaiapoi Historic Court House (NZHPT Cat 2) the Museum holds an extensive early social history and pictorial collection, taonga, early newsprint, Kaiapoi Lodges and Kaiapoi Woollen Mills collections. The building was expanded in 1999. The Museum is an important community facility, entirely run by a dedicated volunteer committee and has recently completed the New Zealand Museums Standards Scheme. While it’s important to acknowledge that everyone was under pressure and much stress at the time and also that people safety always needs to come first, the Kaiapoi Museum deserve to know why the hasty decision to demolish was made and as a sector we need to work to prevent destruction to heritage. Collections and buildings sustained damage across the Canterbury region; some damage not yet been fully assessed or may be under-reported. Recovery will take years with some total losses to some heritage structures and contents. 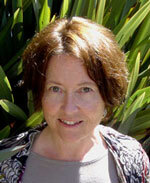 Judith Taylor is the South Island Museum Development Officer for National Services Te Paerangi. Learn more about Judith. Thank you for this Blog. Personally I think this is appalling. Firstly – the building, I feel that we have lost a piece of our heritage,that might have been saved. And further, the insensitive remarks about the museum being an old brick building full of trinkets. My Ancestors settled in Kaiapoi in 1874, so the Kaiapoi is close to my heart, and particularly historical documents and photographs that the Museum houses. Canterbury is one of the cradles of colonisation in this country, and the idea that A district council fails to give care and regard to aspects of our heritage is disturbing. I read the article a number of times, and could not ascertain who the actual person of responsibility was. How polite of you.